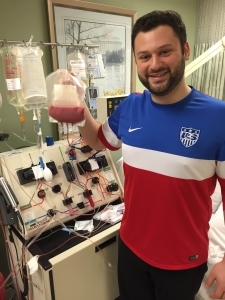 Ari Goldstein didn’t get to donate to his first match, but when Gift of Life contacted him again he was ready to get started. Because only 30 percent of patients needing a transplant find a match among family members, 70 percent of patients must rely on volunteer bone marrow and blood stem cell donors who have joined one of the worldwide donor registries. Gift of Life is one of two public registries in the United States, and is a member of the World Marrow Donor Association (WMDA). How do people become donors? Volunteer donors can join the Gift of Life registry either at a donor drive, or by requesting a swabbing kit on our website or by calling 800-9MARROW. Many people join registries at recruitment drives. Most drives today use swabbing kits, which use cells collected on a giant cotton swab from the inside of the cheek. The swabs are packaged and sent to a lab for tissue typing to determine the HLA markers. Once the tissue type is determined, that information is entered in the registry and made available for worldwide searches by transplant centers and physicians. While anyone between 18 and 60 can join the registry, the most frequently requested donors are young and male. Young people produce more stem cells, and due to their larger physical size, men produce more stem cells. The most requested donor group is 18 to 35, yet all donors can remain in the registry until their 61st birthday, and plenty of donors are called from the 36 to 60 group! Gift of Life actively encourages young people to join the registry through several educational programs, including the Campus Ambassador Program for college students and Senior Swabbers for high schools students. What happens when a donor is identified as a match? When a donor comes up in the database as a match, the registry he or she joined is contacted by the transplant center, and asked to call the donor in for Confirmatory Typing. The prospective donor is asked for a blood draw that is sent to a laboratory for an in-depth HLA analysis to find out exactly how closely the potential donor's human leukocyte antigens — key factors in the immune system — match up with the recipient’s tissue type. A match may be a partial or a perfect match. At the same time, tests for infectious diseases are conducted. The Confirmatory Typing (CT) team will counsel the prospective donor about the donation process, and ensure that the donor is fully committed to the donation. This commitment is important, because once the donation is scheduled, the recipient undergoes rigorous treatments to clear their body of diseased blood cells, including chemotherapy and/or radiation therapy. This completely depletes their immune system and their own bone marrow, meaning they are no longer capable of producing blood cells on their own. At that point, if the transplant does not happen, the patient will not survive. Once the donor has committed to the donation, the Work Up Coordinator will arrange the donation. Whether the donation will be bone marrow or blood stem cells, everything must be set in motion so that the transplant occurs exactly when the patient is ready. The Work Up team will arrange for the donor to have a physical exam as well as any required transplant preparation, such as injections of Neupogen to stimulate stem cell production. The Work Up team also makes travel arrangements, if needed. A representative from Gift of Life will be present throughout the donation process, ensuring that the donor has everything needed – such as food, transportation and moral support. Gift of Life does everything possible to make donation a seamless process for the donor and his or her family. Those donating bone marrow will have a surgical procedure under general anesthesia. Marrow is drawn from the largest bone in the body, the hip bone, specifically from the iliac crest – easily found by putting your hands on your hips with thumbs forward and fingers towards your back. The iliac crest is the ridge you can feel under your fingers on each side. Marrow is extracted from both sides at the same time to speed up the process. Doctors use a special syringe to draw the marrow out of the bone. The process is normally completed in under two hours. Recovery can take several days, as the bone marrow naturally regenerates. Donors often report their back is sore for anywhere from one to three days afterwards, treatable with over the counter pain relievers. Most return to work within one to two days, and usually return to normal levels of exercise within a week or ten days, depending on how fast the marrow regenerates. Donors providing PBSCs must be prepared for several days in advance – a daily injection is given to stimulate the stem cells to move out of the marrow and into the blood stream. The first injection is given at a clinic, and following injections are done by a visiting nurse at the donor’s home. At the donation center the donor’s blood is drawn from one arm to pass through an apheresis machine, and is then returned into the other arm. Inside the machine, the blood is separated into its components and the stem cells only are separated out and collected. The process may take several hours, and it is important for the donor to eat soon after donation. A Gift of Life representative is always there help to ensure that every donor is well taken care of! Gift of Life donor Eric Gurevich shows the bag of peripheral blood stem cells that were collected from his blood by the apheresis machine behind him. This small bag contains billions of stem cells that will create an entirely new immune system for his transplant recipient. Once the cells are infused into the recipient's blood, the cells naturally find their way into the bone marrow cavities and begin producing new blood cells and a new immune system. Stems cells regenerate naturally, so donors providing PBSCs normally feel fully recovered in 24 to 36 hours. What happens to the donation? Once the bone marrow or blood stem cells are collected and prepared, they are carried in cooled containers by a courier to the transplant center where the recipient will receive his or her transplant. The package never leaves the courier’s hands, and qualifies for a special customs clearance if the transplant center is overseas. Why was the donation delayed? Everything in the donation process is designed to ensure that the patient is fully prepared to receive the transplant so he or she will have the best chance of recovery. Sometimes delays occur due to the patient needing more time in the preparation process. A Work Up Coordinator will keep every donor informed as much as possible. Why can’t I donate? Will I be able to in the future? Part of the donation process involves a thorough review of any past illnesses or current conditions that may prevent you from donating. Some of these have to do with protecting the donor's health, and most are designed to protect the recipient. Many people who cannot donate bone marrow due to back or hip injuries or conditions may still donate peripheral blood stem cells. Anyone with a temporary condition that prevents them from donating now may be able to donate in the future. This donor's status will be put on hold until a determination is made that he or shee can reenter the registry. Pregnant women may not donate while pregnant, due to the production of antibodies that can cause rejection of the transplant (Graft-Versus-Host disease). Three months after delivery of the child, women may once again donate bone marrow and peripheral stem cells. If a prospective donor is called but later on the donation is cancelled, it is possible that several matches were available and another donor was selected for transplant. The donation coordinator will share available information where possible, but details may not be available from the transplant center. Continue to next section, The Transplant Process.